Ashampoo UnInstaller does a better and more thorough job of removing software than Windows ever could. By logging each system modification during installations, the program ensures that, when you decide to remove an application, each and every file and Registry change are eliminated so no space-consuming leftovers remain. 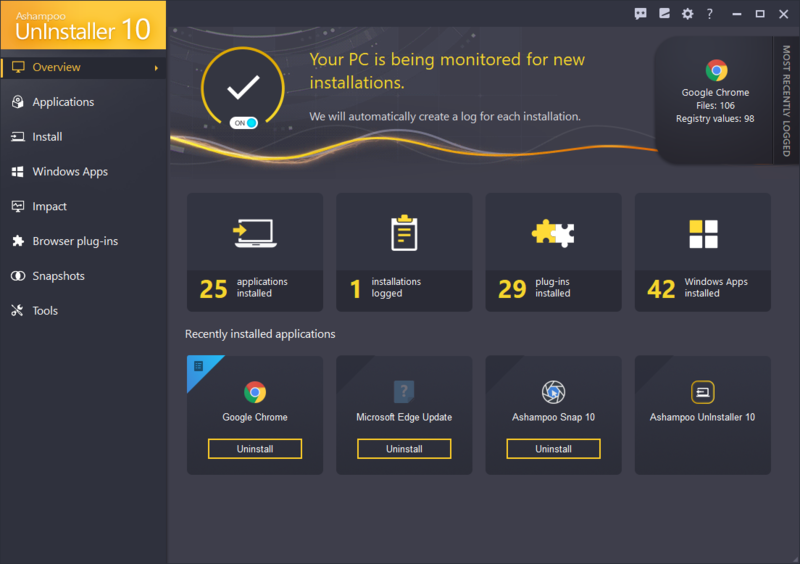 Ashampoo UnInstaller 8 features Deep Cleaning technology that scans your system for residuals and is especially useful for installations that haven't been logged by the program. In tandem with the new profile database for popular applications, any program can now be removed without leftovers. And files that include personal information can now be wiped in the process for better privacy protection. This also includes nested setups, hidden browser add-ons or any other unsolicited programs. Programs can be uninstalled one by one or in batches. The built-in snapshot feature makes it incredibly easy to compare different system states and find out exactly what modifications were made during an installation, but also during program use. For faster uninstalls, users can now drag application shortcuts onto the UnInstaller 8 program icon to instantly trigger their removal or use the improved tray menu. The program now also features a history view of all recently uninstalled applications. In addition, Ashampoo UnInstaller 8 features multiple system maintenance and cleaning tools. All modules, including cleaners, have been updated and support for Opera added. $60 for an uninstaller??? WTH? Who is dumb enough to pay for this junk? Nice scam these losers have! 40 bucks for an uninstaller? GTFO! Ashampoo are a reputable German company that have been around for many years & make some good software. They usually do a good discount for renewals. I can only wonder what our friend D-Brain below is on? Reading its reviews it would seem to be some kind of primitive ape language (probably baboon or gibbon?) but there are occasional smatterings that could possibly be English? Maybe a new & still evolving life form is attempting to communicate? If you look at a review of d***Brain's reviews, all of which are available on this site you will notice that there is not one single positive review leaving me to the conclusion that we have a very immature and probably angry person posting here and/or we have a paid troll in our midst. While I have only a few Ashampoo products on my computers I trust them and they work as designed. I would not hesitate to use this one if the need arose. Tested this program for 30days, and now desided to buy it, b/c it's a great tool, to me it is, I install and remove allot of applications almost on a daily basis. I've got it for 9$ that's a fair price. I purchased this program because I like it but recently it keeps asking me for the registration number every time I start it and in order to get the most utility out of it I use it for every installation so I have to keep a small text file with the serial number handy. I already visited the web site and it states that I should uninstall, delete the subdirectory and then reinstall so I did that and rebooted and get the same problem ... otherwise it's a great program and the program does what it's supposed to do very well. -1 for the annoying bug. This program has so many features in it, how can you rate it lower. This program is the best uninstaller, that I have found. Does a good job at uninstalling programs, The install monitor is nice, though it needs work. Outside of that don't touch a thing. I don't think there's an app on my computer that has saved me from more trouble than this. Always use it when installing new things to see how bloated they are and see what needs to be removed manually. Highly recommended.